Online warriors who are part of the Battlefield Premium program can now take to a slightly more futuristic war zone than they’ve been used to for the last year. 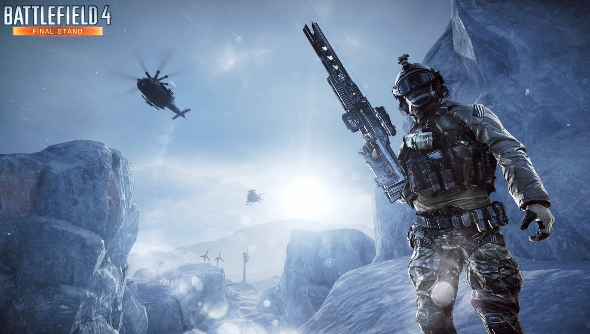 Battlefield 4’s next DLC pack – Final Stand – is fast approaching, and a beta version is now available to play on the Community Test Environment. Detailed on the Battlefield blog, Final Stand throws a few ‘near-future’ sci-fi-ish elements into the Battlefield formula, offering a few homages to Battlefield 2142. The game’s new weapons and gadgets all have a whiff of super-tech about them, with the Rorsch rail gun blasting craters in tanks and the new HT-95 Levkov flying vehicle allowing you to quickly strafe to avoid missiles. Target Detectors for DMR and Carbines will auto-spot enemies to help make combat intel gathering little more than a mouse sweep, and a DS-3 DECOY gadget will place false beep markers on enemy maps to distract them from your real position. The snowy maps can be traversed by a new snowmobile, which sounds like it will be useful in the mountain regions of the Hammerhead map. The other three maps are Operation Whiteout, which features a submarine base, Hangar 21, which is set around a base filled with military secrets, and Giants of Karelia, where you’ll visit a high-tech weapons factory. If you want to get going now, you’ll need to be a Premium member and sign up for the Community Test Environment.